In September of 1945, Bishop Franklin Corley was sent to the Japanese city of Hiroshima as part of the American occupation forces then entering that country. As one of the first American soldiers to enter the stricken city, he encountered many of the people who were helping to re-establish order from the chaos. One of these people was Father Johannes Siemes (last name pronouced "Zee-Muss"), a German priest with the Novitists of the Society of Jesus in Nagatsuki. Father Siemes had been an eyewitness to the atomic bomb's detonation over the city on August 6 and he was directly involved in the post-bombing rescue. Shortly after they met, Father Siemes gave a typed account of his observations to Mr.Corley, who then brought the manuscript back to the United States where it lay for fifty years. Thanks to the kind cooperation of Mr. Corley's son, a complete and unedited version of Father Siemes' account is presented below. His observations are a priceless insight into this event, as are his thoughts on the implications of total war and its results. Shown along with the account are Bishop Corley's photographs of Hiroshima, some of which were taken while the city still smoldered. August 6th began in a bright, clear, summer morning. About 7 o'clock, there was an air raid alarm which we had heard almost every day and a few planes appeared over the city. No one paid attention and at about 8:00, the all-clear sounded. I am sitting in my room at the Novitists of the Society of Jesus in Nagatsuki: during the past half year, the philosophical and theological section of our mission had been evacuated to this place from Tokyo. The Novitists is situated approximately 2 kilometers from Hiroshima, half-way up the side of a broad valley which stretches from the town at sea level into the mountainous hinterland, and through which courses a river. From my window, I have a wonderful view down the valley to the edge of the city. Suddenly --- the time is approximately 8:15 -- the whole valley is filled by a garish light which resembles the Magnesium light used in photography, and I am conscious of a wave heat. I jump to the window to find out the cause of this remarkable phenomenon, but I see nothing more than that brilliant yellow light. As I make for the door, it doesn't occur to me that the light might have something to do with enemy planes. On the way from the window, I hear a moderately loud explosion which seems to come from a distance and, at the same time, the windows are broken in with a loud crash. There has been an interval of perhaps ten seconds since the flash of light. I am sprayed by fragments of glass. The entire window frame has been forced into the room. I realize now that a bomb has burst and I am under the impression that it exploded directly over our house or in the immediate vicinity. I am bleeding from cuts about the hands and head. I attempt to get out of the door. It has been forced outwards by the air pressure and has become jammed. I forced an opening in the door by means of repeated blows with my hands and feet and come to a broad hall-way from which open the various rooms. Everything is in a state of confusion. All windows are broken and all the doors are forced inwards. The book-shelves in the hall-way have tumbled down. I do not note a second explosion and the fliers seem to have gone on. A few are bleeding in the room, but none has been seriously injured. All of us have been fortunate since it is now apparent the wall of my room opposite the window has been lacerated by long fragments of glass. We proceed to the front of the house to see where the bomb has landed. There is no evidence, however, of a bomb crater; but the southeast section of the house is severely damaged. Not a door nor a window remains. The blast of air had penetrated the entire house from the southeast, but the house still stands. It is constructed in the Japanese style with a wooden framework, but has been greatly strengthened by the labor of our Brother Gropper as is frequently done in Japanese homes. Only along the front of the chapel which adjoins the house have three supports given away (it has been made in the manner of a Japanese temple, entirely out of wood). Down in the valley, perhaps one kilometer towards the city from us, several peasant homes are on fire and the woods on the opposite side of the valley are aflame. A few of us go over to help control the flames. While we are attempting to put things in order, a storm comes up and it begins to rain. Over the city, clouds of smoke are rising and I hear a few slight explosions. I come to the conclusion that an incendiary bomb with an especially strong explosive action has gone off down in the valley. A few of us saw three planes at great altitude over the city at the time of the explosion. I, myself, saw no aircraft whatsoever. Perhaps a half-hour after the explosion, a procession of people began to stream up the valley from the city. The crowd thickens continuously. A few come up the road to our house. Their steps are dragging. Many are bleeding or have suffered burns. We give them first aid and bring them into the chapel, which we have in the meantime cleaned and cleared of wreckage, and put them to rest on the straw mats which constitute the floor of Japanese houses. A few display horrible wounds of the extremities and back. The small quantity of fat which we possessed during this time was soon used up in the care of the burns. Father Nekter, who, before taking holy orders, had studied medicine, ministers to the injured, but our bandages and drugs are soon gone. We must be content with cleansing the wounds. More and more of the injured come to us. The least injured drag the more seriously wounded. There are wounded soldiers, and mothers carrying burned children in their arms. From the houses of the farmers in the valley come word: " Our houses are full of wounded and dying. Can you help, at least by taking the worst cases ? " The wounded come from the sections at the edge of the city. They saw the bright light, their houses collapsed and buried the inmates in their homes. Those that were in the open suffered instantaneous burns, particularly on the lightly clothed or unclothed parts of the body. Numerous fires spring up which soon consumed the entire district. We now conclude that the epicenter of the explosion was at the edge of the city near the Yokogawa Station, three kilometers away from us. We are concerned about Father Kepp, who, that same morning, went to hold Mass at the Sisters of the Poor, who have a home for children at the edge of the city. He had not returned as yet. Toward noon, our large chapel and library are filled with the seriously injured. The procession of refugees from the city continues. Finally, about 1:00, Father Kepp returns together with the Sisters. Their house and the entire district where they live has burned to the ground. Father Kepp is bleeding about the head and neck, and he has a large burn on the right palm. He was standing in front of the nunnery ready to go home. All of a sudden, he became aware of the light, felt the wave of heat and a large blister formed on his hand. The windows were torn out by the blast. He thought that the bomb had fallen in his immediate vicinity. The nunnery, also a wooden structure made by our Brother Gropper, still remained but soon it was noted that the house is as good as lost because the fire, which began at many points in the neighborhood, sweeps closer and closer, and water is not available. There is still time to rescue certain things from the house and to bury them in an open spot. Then the house is swept by flame, and they fight their way back to us along the shore of the river and through the burning streets. Soon comes news that the entire city has been destroyed by the explosion and that it is on fire. What became of Father Superior and the three other Brothers who were at the center of the city at the Central Mission and Parish House? We had up to this time not given them a thought because we did not believe that the effects of the bomb encompassed the entire city. Also, we did not want to go into town except under pressure of dire necessity, because we thought that the population was greatly perturbed and that it might take revenge on any foreigners whom they might consider spiteful onlookers of their misfortune, or even spies. Brother Stolto and Brother Balighagen go down to the road which is still full of refugees and bring in the seriously injured who have sunken by the wayside, to the temporary aid station at the village school. There, iodine is applies to the wounds but they are left uncleansed. Neither ointments nor other therapeutic agents are available. Those that have been brought in are laid on the floor and no one can give them any further care. What could one do when all means are lacking ? Under these circumstances, it is almost useless to bring them in. Among the passersby, there are many who are uninjured. In a purposeless, insensate manner, distraught by the magnitude of the disaster, most of them rush by and none conceives the thought only with the welfare of their own families. It became clear to us during these days that the Japanese displayed little initiative, preparedness, and organizational skill in preparation for catastrophes. They despaired of any rescue work when something could have been saved by a cooperative effort, and fatalistically let the catastrophe take its course. When we urged them to take part in the rescue work, they did everything willingly, but on their own initiative they did very little. At about 4:00 in the afternoon, a theology student and two kindergarden children, who lived at the Parish House in the city, came and reported that the church, Parish House and adjoining buildings had burned down, and that Father Superior, LaSalle and Father Schiffer had been seriously injured and that they had taken refuge in Asano Park on the river bank. It is obvious that we must bring them in since they are too weak to come here on foot. Hurriedly, we get together two stretchers and seven of us rush toward the city. Father Rekter comes along with food and medicine. The closer we get to the city, the greater is the evidence of destruction and the more difficult it is to make our way. The houses at the edge of the city are all severely damaged. Many have collapsed or burned down. Further in, almost all of the dwellings have been damaged by fire. Where the city stood, there is a gigantic burned out sear. We make our way along the street on the river bank among the burning and smoking ruins. Twice we are forced into the river itself by the burning and smoking ruins. Twice we are forced into the river itself by the heat and smoke at the level of the street. Frightfully burned people beckon to us. Along the way, there are many dead and dying. On the Misasa Bridge, which leads into the inner city, we are met by a long procession of soldiers who have suffered burns. They drag themselves along with the help of staves or are carried by their less severely injured comrades....an endless procession of the unfortunate. Abandoned on the bridge, there stand with sunken heads a number of horses with large burns on their flanks. On the far side, the cement structure of the local hospital is the only building that remains standing. The interior, however has been burned out. It acts as a landmark to guide us on our way...Finally we reach the entrance of the park. A large proportion of the populace has taken refuge there, but even the trees of the park are on fire in several places. Paths and bridges are blocked by the trunks of fallen trees and are almost impassable. We are told that a high wind, which may well have resulted from the heat of the burning city, had uprooted the large trees. It is now quite dark. Only the fires which are still raging in some places at a distance, give out little light. At the far corner of the park, on the river bank itself, we at first come upon our colleagues. Father Schiffer is on the ground pale as a ghost. He has a deep incised wound behind his ear and has lost so much blood that we are concerned about his chances for survival. The Father Superior has suffered a deep wound of the lower leg. Father Cieslik and Father Kleinserge have minor injuries but are completely exhausted. While they are eating the food that we have brought along, they tell us of their experiences. They were in their rooms at the Parish House -- it was 8:15, exactly the time when we had heard the explosion in Nagatsuki -- when came the intense light and immediately thereafter the sound of breaking windows, walls and furniture. They were showered with glass splinters and fragments of wreckage. Father Schiffer was buried beneath a portion of a wall and suffered a severe head injury. The Father Superior received most of the splinters in his back and lower extremity from which he bled copiously. Everything was thrown about in the rooms themselves, but the wooden framework of the house remained intact. The solidity of the structure that was the work of Brother Gropper again shown forth. 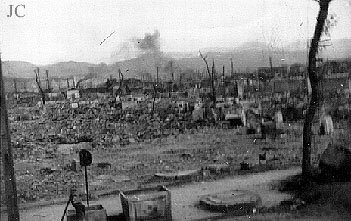 They had the same impression that we had in Nagatsuki: that the bomb had burst in their immediate vicinity. The Church, school and all buildings in the immediate vicinity collapsed at once. Beneath the ruins of the school, the children cried for help. They were freed with great effort. Several others were also rescued from the ruins of nearby dwellings. Eve the Father Superior and Father Schiffer, despite their wounds, rendered aid to others and lent a great deal of blood in the process. In the meantime, fires which had begun some distance away are raging even closer, so that it becomes obvious that everything would soon burn down. Several objects are rescued from the Parish House and were buried in a clearing in front of the Church but certain valuables and necessities which had been kept ready in case of fire could not be found on account of the confusion which had been wrought. It is high time to flee, since the oncoming flames leave almost no way open. Fukai, the secretary of the Mission, is completely out of his mind. He does not want to leave the house and explains that he does not want to leave the and explains that he does not want to service the destruction of his fatherland. He is completely uninjured. Father Kleinserge drags him out of the house on his back and he is forcefully carried away. Beneath the wreckage of the houses along the way, many have been trapped and they scream to be rescued from the oncoming flames. They must be left to face their fate. The way to the place in the city to which one desires to flee is no longer open and one must make for Asano Park. Fukai does not want to go further and remains behind. He has not been heard from since. In the park, we take refuge on the bank of the river. A very violent whirlwind now begins to uproot large trees, and lifts them high into the air. As it reaches the water, a water spout forms which is approximately 100 meters high. The violence of the storm luckily passes us by. Some distance away, however, where numerous refugees have taken shelter, many are blown into the river. Almost all who are in the vicinity have been injured and have lost relatives who have been pinned under the wreckage or who have been lost sight of during the flight. There is no help for the wounded and some die. No one pays any attention to a dean man lying nearby. The transportation of our own wounded is difficult. It is not possible to dress their wounds properly in the darkness and they bleed again upon slight motion. As we carry them on the shaky litters in the dark over fallen trees of the park, they suffer unbearable pain as the result of the movement, and lost dangerously large quantities of blood. Our succouring angel in this difficult situation is an unknown Japanese Protestant Pastor. He has brought us a boat and offers to take our wounded upstream to a place where progress is easier. First, we lower the litter containing Father Schiffer into the boat and two of us accompany him. We plan to bring the boat back for the Father Superior. The boat returns about one-half hour later and the pastor requests that several of us help in the rescue of two children whom he had seen in the river. We rescue them. They have severe burns. Soon they suffer chills and die in the park. The Father Superior is conveyed in the boat in the same manner, as Father Schiffer. The theology student and myself accompany him. Father Cieslik considers himself strong enough to make his way on foot to Nagatsuki with the rest of us, but Father Kleinserge cannot walk so far and we leave him behind and promise to come for him and the housekeeper tomorrow. From the other side of the stream comes the whinny of horses who are threatened by the fire. We land on a sand spit which juts out of the shore. It is full of wounded who have taken refuge there. They scream for aid for they are afraid of drowning as the river may rise with the sea, and cover the sand spit. They themselves are too weak to move. However, we must press on and finally we reach the spot where the group containing Father Schiffer is waiting. Here a rescue party had brought a large case of fresh rice cakes but there is no one to distribute them to the numerous wounded that lie all about. We distribute them to those that are nearby and also help ourselves. The wounded call for water and we come to the aid of a few. Cries for help are heard from a distance, but we cannot approach the ruins from which they come. A troop of soldiers comes along the road and their officer notices that we speak a strange language. He at once draws his sword, screamingly demands who we are and threatens to cut us down. Father Laures Jr., seizes his arm and explains that we are German. We finally quiet him down. He thought that we might be Americans who had parachuted down. Rumors of parachutists were being bandied about the city. The Father Superior, who was clothed only in a shirt and trousers, complains of feeling freezing cold, despite the warm summer night and the heat of the burning city. The one man among us who possesses a coat give it to him and, in addition, I give him my own shirt. To me, it seems more comfortable to be without a shirt in the heat. In the meantime, it has become midnight. Since there are not enough of us to man both litters with four strong bearers we determine to remove Father Shiffer first to the outskirts of the city. From there, another group of bearers is to take over to Nagatsuki ; the others are to turn back in order to rescue the Father Superior. I am one of the bearers. A theology student goes to warn us of numerous wires, beams, and fragments of ruins which block the way and which are impossible to see in the dark. Despite all precautions, our progress is stumbling and our feet get tangled in the wire. Father Kruer falls and carries the litter with him. Father Schiffer becomes half unconscious from the fall and vomits. We pass and injured man who sits all alone among the hot ruins and whom I had not seen previously on the way down. On the Misasa Bridge, we meet Father Tappe and Father Lubmer, who have come to meet us from Nagatsuki. They had dug a family out of the ruins of their collapsed house some fifty meters off the road. The Father of the family was already dead. The had dragged out two little girls and placed them by the side of the road. Their mother was still trapped under some beams. They had planned to complete the rescue and then press on to meet us. At the outskirts of the city, we put down the litter and leave two men to wait until those who are to come from Nagatsuki appear. The rest of us turn back to fetch the Father Superior. Most of the ruins have now burned down. The darkness kindly hides the many forms that lie on the ground. Only occasionally in our quick progress do we hear call for help. One of us remarks that the remarkable burned smell reminds us of incinerated corpses. The upright, squatting form which had passed by previously is still there. Transportation on the litter, which has been constructed out of beards, must be very painful to Father Superior, whose entire back is full of fragments of glass. In a narrow passage at the edge of town, a car forces us to the edge of the road. The litter bearers on the left side fall into a two meter deep ditch which they could not see in the darkness. Father Superior hides his pain with a dry choke, but the litter which is now no longer in one piece cannot be carried further. We decide to wait until Brother Kinjo can bring a hand cart from Nagatsuki. He soon comes back with one that he has requisitioned from a collapsed house. We place Father Superior on the cart and wheel him the rest of the way, avoiding as much as possible the deeper pits in the road. About half past five in the morning, we finally arrive at the Novitiate. Our rescue expedition had taken almost twelve hours. Normally, one could go back and forth to the city in two hours. Our two wounded were now, for the first time, properly dressed. I get two hours sleep on the floor; someone else has taken my own bed. Then I read a Mass in gratiarum actienem; it is the 7th of August, the anniversary of the foundation of our Society. We then bestir ourselves to bring Father Kleinserge and other acquaintances out of the city. We take off again with the hand cart. The bright day now reveals the frightful picture which last night's darkness had partly concealed. Where the city stood, everything as far as the eye could reach is a waste of ashes and ruin. Only several broken skeletons of buildings completely burned out in the interior remain. The banks of the river are covered with dead and wounded, and the rising waters have here and there covered some of the corpses. On the broad street in the Hakushima district, naked, burned, cadavers are particularly numerous. Among them are the wounded who still live. A few have crawled under the burnt-out autos and trams. Frightfully injured forms beckon to us and then collapse. An old woman and a girl whom she is pulling along with her , fall down at our feet. We place them on our cart and wheel them to the hospital at whose entrance a dressing station has been set up. Here the wounded lie on the hard floor, row on row. Only the largest wounds are carefully dressed. We convey another soldier and an old woman to this place but we cannot move everybody who lies exposed in the sun. It would be endless and it is questionable whether those whom we can drag to the dressing station can come out alive, because even here nothing really effective can be done. Later, we ascertain that the wounded lay for days in the burnt-out hall-ways of the hospital and there they died. We must proceed to our goal in the park and are forced to leave the wounded to their fate. We make our way to the place where our Church stood to dig up those few belongings that we buried yesterday. We find them intact. Everything else has been completely burned. In the ashes, we find a few molten remains of the holy vessels. At the park, we lead the housekeeper and a mother with her two children on the cart. Father Kleinserge feels strong enough, with the aid of Brother Nobuhara, to make his way home on foot. The way pack takes us once again past the dead and wounded in Hakushima. Again no rescue parties are in evidence. At the Misasa Bridge, there still lies the family which Father Tappe and Luhmer had yesterday rescued from the ruins. A piece of tin had been placed over them to shield them from the sun. We give them and those nearby, water to drink and decide to rescue them later. At three o'clock in the afternoon, we are back in Nagatsuki. After we have had a few swallows and a little food, Father Stelte, Luhmer, Erlinghagen and myself, take off once again to bring in the family. Father Kleinserge requests that we also rescue two children who had lost their mother and who had lain near him in the park. On the way, we were greeted by strangers who had noted that we were on a mission of mercy and who were carrying the wounded about on litters. As we arrived at the Misasa Bridge, the family that had been there were gone. They might well have been borne away in the meantime. There was a group of soldiers at work taking away those that had been sacrificed yesterday. More than thirty hours had gone by until the first official rescue party had appeared on the scene. We find both children and take them out of the park: six year old girl who was uninjured and a twelve year old girl who had been burned about the head, hands, and legs, and who had lain for thirty hours without care in the park. The left side of her face and the left eye were completely covered with blood and pus, and we thought that she had lost an eye. When the wound was later washed, we noted that the eye was intact and that the lids had just become stuck together. On the way home we took another group of three refugees with us. The first wanted to know, however, of what nationality we were. They too, feared that we might be Americans who had parachuted in. When we arrived in Nagatsuki, it had just become dark. We took under our care fifty refugees who had lost all their belongings. The majority of them were wounded and not a few had dangerous burns. Father Nekter treated the wound as well as he could with the few medicine that we could, with effort, gather up. He had to confine himself in general to cleaning the wound of purulent material. Even those with the smaller burns are very weak and all suffered from diarrhea. In the farm houses in the vicinity, almost everywhere there are also wounded. Father Nekter made daily rounds and noted in the capacity of a painstaking physician and was a great Samaritan. Our work was, in the eyes of the people, a greater boast for Christianity than all our efforts during the preceding long years. Three of the severely burned in our house died within the next few days. Suddenly the pulse and respirations ceased. It is certainly a sign of our good care that so few died. In the official aid stations and hospitals, a good third or half of those that had been brought in died. They lay about there almost without care, and very high percentage succumbed. Everything was lacking; doctors, assistants, dressings, drugs, etc. In an aid station at a school at a nearby village, a group of soldiers for several days did nothing except to bring in and cremate the dead being in the school. During the next few days, funeral processions passed our house from morning to night, bringing the deceased to a small valley nearby. There, in six places, the dead were burned. People brought their own wood and themselves did the cremation. Father Dalrer and Father Yeures found a dead man in a nearby house who had already become bloated and who omitted a frightful odor. They brought him to this valley and incinerated him themselves. Even late at night, the little valley was lit up by the funeral pyres. We made systematic efforts to track our acquaintances and the families of the refugees who we had sheltered. Frequently, after the passage of several weeks, someone was found in a distant village or hospital but of many there was no news. These were apparently dead. We were lucky to discover the mother of the two children whom we had found in the park and who had been given up for dead. After three weeks, she saw her children once again. In the great joy of the reunion were mingled the tears for those whom we shall not see again. The magnitude of the disaster that befell Hiroshima on August 6th was only slowly pieced together in my mind. I lived through the catastrophes and saw it only in flashes, which only gradually were merged to give me a total picture. What simultaneously happened in the city as a whole is as follows : As a result of the explosion of the bomb at 8:15, almost the entire city was destroyed by a single blow. Only small outlying districts in the southern and eastern parts of the town excaped complete destruction. The bomb exploded over the center of the city. 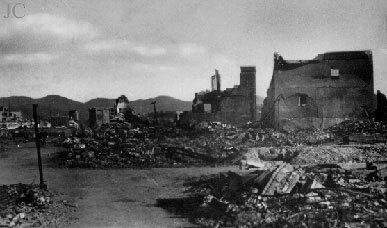 As a result of the blast, all the small Japanese houses in a diameter of five kilometers, which encompassed 99% of the city, collapsed or were blown up. Those who were in the houses were buried in the ruins. Those who were in the open sustained burns resulting from contact with the substance or rays omitted by the bomb. Where the substance struck in quantity, fires sprung up. these spread rapidly. The heat which rose from the center created a whirlwind which was effective in spreading fire throughout the whole city. Those who had been cut off by the flames became casualties. As much as six kilometers from the center of the explosion, all houses were damaged and many collapsed and caught fire. Even fifteen kilometers away, windows were broken. It was rumored that the enemy fliers had first spread an explosive and incendiary material over the city and then had created the explosion and ignition. A few maintained that they saw the planes drop a parachute which had carried something that had exploded at a height of 1,000 meters. The newspapers called the bomb an "atomic bomb" and noted that the force of the blast had resulted from the explosion of uranium atoms, and that gamma rays had been sent out as a result of this, but no one knew anything for certain concerning the nature of the bomb. How many people were a sacrifice to this bomb? Those who had lived through the catastrophe placed the number of the deaths at least 100,000. Hiroshima had a population of 400,000. Official statistics place the number who had died at 70,000 up to September 1st, not counting the missing....and 130,000 wounded, among them 43,500 severely wounded. Estimates made by ourselves on the basis of groups known to us show that the number of 100,000 dead is not too high. Near us there are two barracks, in each of which forty Korean workers lived. On the day of the explosion they were laboring on the streets of Hiroshima. Four returned alive to one barrack and sixteen to the other. 600 students of the Protestant girl's school worked in a factory, from which only thirty to forty returned. Most of the peasant families in the neighbourhood lost one or more of their members who had worked at factories in the city. Our next door neighbour, Tamare, lost two children and himself suffered a large wound since as it happened, he had been in the city on that day. The family of our reader suffered two dead, father and son; thus a family of five members suffered at least two losses, counting only the dead and severely wounded. There died the Mayor, the President of the Central Japan District, the Commander of the City, a Korean prince who had been stationed in Hiroshima in the capacity of an officer, and many other high-ranking officers. Of the professors of the University, thirty-two were killed or severely injured. Especially hard hit were the soldiers. The Pioneer Regiment was almost entirely wiped out. 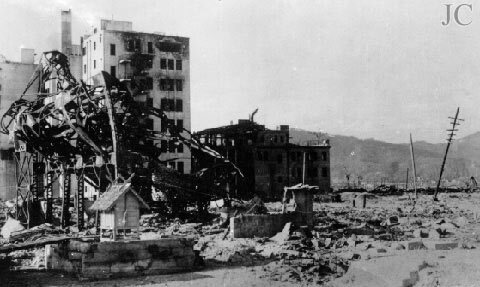 The barracks were near the center of the explosion. Thousands of wounded who died later could doubtless have been rescued if the received proper treatment and care, but rescue work in a catastrophe of this magnitude had not been envisioned; since the whole city had been knocked out at a blow, everything which had been prepared for emergency work was lost, and no preparation had been made for rescue work in the outlying districts. Many of the wounded also died because they had been weakened by under nourishment and consequently the strength to recover. Those who had their normal strength and who received good care slowly healed the burns which had been associated by the bomb. There were also cases, however, whose prognosis seemed good who died suddenly. There were also some later, after an inflammation of the pharynx and oral cavity had taken place. We thought at first that this was the result of inhalation of the substance of the bomb. Later, a commission established the thesis that gamma rays had been given out at the time of the explosion, following which the internal organs had been injured in a manner resembling that consequent upon Roentgen irradiation. this produces a diminution in the number of the white corpuscles. Only several cases are known to me personally where individuals who did not have external burns died later. Father Kleinserge and Father Sieslik, who were near the center of the explosion, but who did not suffer burns became quite weak some fourteen days after the explosion. Up to this time small incised wounds had healed normally, but thereafter the wounds which were still unhealed became worse and are to date (in September) still incompletely healed. The attending physician demonstrated a leucoponis. There thus seems to be some truth in the statement that radiation had some effect on the blood. I am of the opinion, however, that their generally undernourished and weakened condition was partly responsible for these findings. It was also noised about that the ruins of this city emitted deadly rays and that many workers who went there to aid in the clearing died, and that the central district would be uninhabitable for some time to come. I have my doubts as to whether such talk is true and myself and others who worked in the rained area for some hours shortly after the explosion suffered no such ill effects. None of us in those days heard a single outburst against the Americans on the part of the Japanese, nor was there any evidence of a vengeful spirit*. The Japanese suffered this terrible blow as part of the fortunes of war...something to be borne without complaint. During this war, I have noted relatively little hatred toward the Allies on the part of the people themselves, although the press has taken occasion to stir up such feelings. After the victories at the beginning of the war, the enemy was rather looked down upon, but when the Allied Offensive gathered momentum and especially after the advent of the majestic B-29's the technical skill of America became an object of wonder and admiration. The following anecdote shows the spirit of the Japanese: A few days after the atomic bombing, the Secretary of the University came to us asserting that the Japanese were ready to destroy San Francisco be means of a equally effective bomb. It is dubious that he himself believed what he told us. He merely wanted to impress upon us foreigners that the Japanese were capable of similar discoveries. In his nationalistic pride, he talked himself into believing this. The Japanese also intimated that the principle of the new bomb was a Japanese discovery. It was only lack of raw materials, they said, which prevented its construction. In the meantime, the Germans were said to have carried the discovery to a further stage and were about to initiate such bombing. The Americans were reputed to have learned the secret from the Germans and they had then brought the bomb to a stage of industrial completion. We have discussed among ourselves the ethics of the use of the bomb. Some consider it in the same category as poison gas and were against its use on a civil population. Others were of the view that in total war, as carried on in Japan, there was no difference between civilians and soldiers and that the bomb itself was an effective for tending to end the bloodshed, warning Japan to surrender and thus to avoid total destruction. It seems logical to us that he who supports total war in principle cannot complain of a war against civilians. The crux of the matter is whether total war in its present form is justifiable, even when it serves a just purpose. Does it not have material and spiritual evil as its consequences which far exceed whatever the good that might result ? When will our moralists give us a clear answer to this question? * Editor's Note: This statement of Father Siemes' is not supported by other events. American pilots taken prisoner during recent attacks against the Japanese Fleet anchored at Kure were being held in Hiroshima at the time of the bombing. After the bombing at least one crewman, whose last name was Brisette, was tied to a tree and stoned to death by a crowd of vengeful civilians. Several others were tied down and left for civilians to beat upon with iron rods while they starved. Having said that, a private Japanese donor living in the Hiroshima area later paid for the building of monuments to American prisoners lost during and immediately after the bombing. The monuments are still well maintained, and placed as close as possible to where each American died. A personal irony for the WTJ staff is that two of the Americans who died at Hiroshima belonged to the same unit as H. Paul Brehm, the dive bomber pilot we interviewed in our Articles section. Right up until his passing, Mr. Brehm kept a photograph he took of a young friend of his named Brissette. 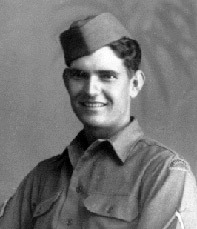 2007 Editor's Note: We have read a conflicting account that airman Brissette was injured at the time of the bombing and transported to another POW camp where he died of radiation burns ten days later. We are going to investigate this to see if we can establish the precise cause of the airman's death. We have also discovered two apparent errors regarding the father's name; a transcription error and what appears to have been a typographical error in the original report. We are now posting his name according to Jesuit records as Johannes Siemes. Manuscript and Corely photographs courtesy of James R. Corley. Father Siemes photo courtesy of the Hiroshima Friendship Center, Hiroshima, Japan.